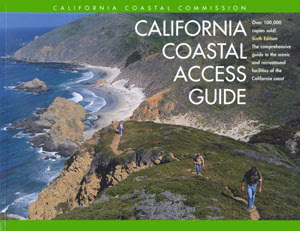 The California Coastal Commission is perhaps the best planning agency in the nation. Both on a planning and project review basis, the Commission carries forward a specific, statutorily established agenda to protect and restore the resources of the California coast. While the Commission's decisions are sometimes controversial, the Commission has had great success in keeping its eye on the ball where key coastal policy issues are at stake. This month, the Commission will meet in Santa Monica, and Agenda Item #5, on the Thursday, January 12th agenda, is a report on the “vertical access” opportunities that the Commission has established in San Diego, Orange, Los Angeles, Ventura, Santa Barbara, and San Luis Obispo Counties. “Vertical access” means: “I can get to the beach.” It means that members of the public will have the legal right and an actual opportunity to walk over the private property located between a public road and the beach, to get to the beach and to the ocean. There are lots of places in the world where members of the public can’t get access to the beach. In California, thanks to the Coastal Commission, we can! The Commission's success in providing "vertical access" along the entire California coast is just one more example of how "regulation is freedom." We tell ourselves what we want to do, and then we do it. That is how our "freedom" to achieve our common goals is actually achieved, in the real world. I'll have to disagree with the basic premise of this post. In the December CCC meeting, the Commission bowed to political pressure to approve the Arana Gulch Master Plan, in favor of Commissioner Mark Stone, who is running for state Assembly. The Master Plan very clearly violates Section 30240 of the Coastal Act, which prohibits development in Environmentally Sensitive Habitat Areas. The Commissioners heard emotional testimony about access to the greenbelt (not the coastline a mile away) by people in wheel chairs, and ignored considerable evidence that the Master Plan is a thinly disguised transportation project that is not at all dependent on local resources (another requirement of Section 30240). In this case, lack of regulation translated into freedom to develop at the expense of critical habitat for endangered species. You are certainly correct, Michael, that the Commission does not have a "perfect" record of following its statutory mandates!